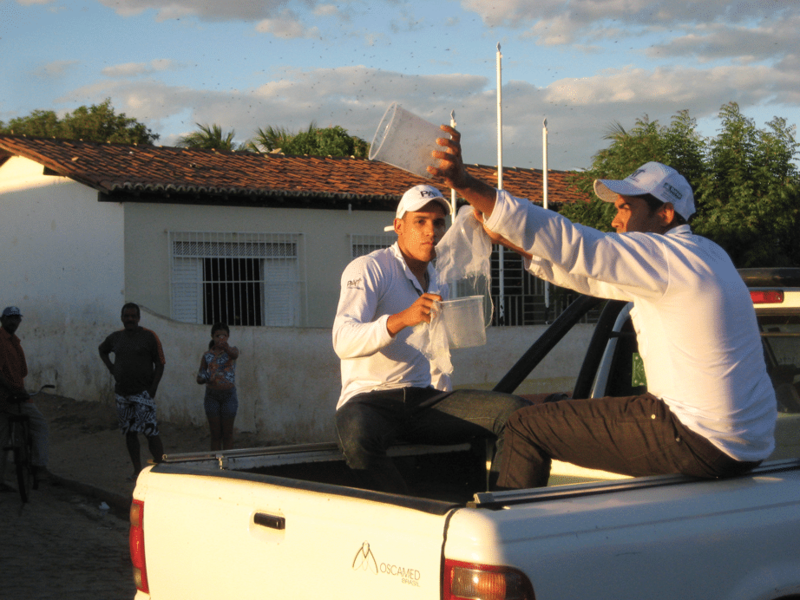 Moscamed operatives release Oxitec mosquitos in Jacobina, Brazil. Photo by Moscamed. For an in-depth feature in issue 14 (available at the DG shop), we visited Oxitec, the British biotech company that is creating GM mosquitoes for release in areas with high rates of dengue fever. The genetically-tweaked bugs – all male – mate with wild female mosquitoes and the resulting offspring never hatch. In short periods of time, this tactic can reduce populations of the dengue-carrying aedes aegypti mosquito by more than 90 percent, radically inhibiting the spread of the disease. In Brazil, Oxitec have teamed up with Moscamed to mount a major public information campaign in targeted areas. People are invited to put their hands into vats of male mosquitoes to realise that they don’t get bitten (it’s only the females that are after your blood). It’s not a “muriçoca”, [a different type of mosquito], no. This is a mosquito of good. Clever family stops and thinks. Yes, it’s like that my people, to fight dengue. Aedes Transgenic Project makes the difference! Esse é o mosquito do bem. Família esperta, pára e pensa. Projeto Aedes Transgênico! Esse sim, faz a diferença! This entry was posted on Thursday, July 10th, 2014 at 11:51 am and is filed under Delayed Gratification magazine, From the team.